A few weeks ago I traveled to Berlin, Germany for the first time. I felt it was an incredible city with a unique marriage of history and culture, but also modernity, especially within the city's architecture. I brought with me my iPad installed with a brilliant app called Paper, and took along my Pencil Stylus. I created a new notebook specifically for my Berlin sketches. Click or Tap to enlarge. 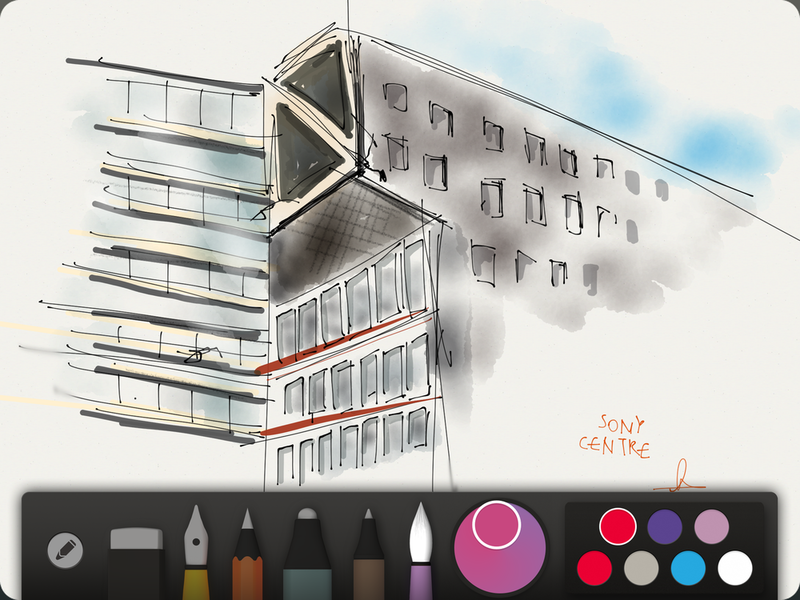 The apps neat and easy to use tools let me draw quick sketches on the go. Click or Tap to enlarge. I used an incredible app from 53 called Paper to document my visit. Paper brings traditional artistic tools like pens, paintbrushes and a mixing palette into the 21st century. The app lets you create artwork in a virtual Japanese folding book that's fun and elegant to use. The whole app is beautifully designed and simple to use which makes it even more pleasurable to work with. In an anti-skeopmorphic world where everything is now flat and 'shadowless'; I really appreciated the 3D designs of the virtual books and brushes. It gives the app a sense of charm and personality which is often missing in creative software. I also used a smart stylus (also from 53) called Pencil. Pencil connects to the app via bluetooth so can tell when you're drawing using the stylus, and when you want to smudge colours with your hands. It also automatically knows when you flip the stylus over to use the eraser tool on the top. This combined with palm rejection technology means you can draw and sketch freely as if working with a real pencil and paper. My iPad with the Paper App, My Pencil Stylus and the finished printed book. Click or Tap to enlarge. Whilst walking around Berlin and when visiting galleries such as The Bauhaus Archive, I used Pencil and Paper on my iPad to draw quick observational sketches or sculptures, buildings and scenes. These incredible products from 53 have all the benefits of traditional tools but the convenience of digital storage, speed and portability. You can view some of my Sketches on the Art page. It was really fun using my iPad to record my visit as it's much more engaging than taking photos and videos. Designing the cover for the printed book. Click or Tap to enlarge. Selecting which pages I wanted to include in the book. Click or Tap to enlarge. 53 has gone the extra mile by partnering with print company MILK and quality notebook producer Moleskine; so after I got back from Berlin, with a few taps my artwork transformed from the digital world into a physical, tactile book. The actual book is handmade and exactly the same as the one I crafted on my iPad, It still folds like a Japanese folding book, and has the vibrancy and scale of my iPad's retina display. The book came wrapped in this packaging and was signed by the person who handmade it. Click or Tap to enlarge. The book is the same size as an iPad screen so the sketches looks just like on screen. Click or Tap to enlarge. It folds beautifully. Click or Tap to enlarge. The binding had been Inspired by a Japanese folding paper book. Click or Tap to enlarge. I'm so pleased with the result and it makes a great souvenir that I designed myself, and instantly brings back memories. The whole experience 53 delivers is above and beyond excellent. The app is great fun to use, the stylus works so intuitively and the printed book has the quality Moleskine is renowned for. I will definitely be using Paper and Pencil on a regular basis!